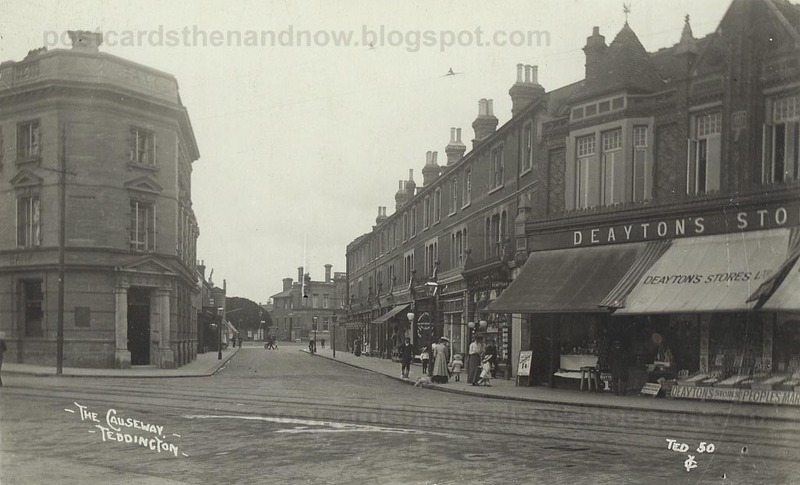 Teddington, Middlesex, The Causeway and Broad Street c1907-12. All four of these postcards were published by Young & Co of Teddington and show Broad Street, one of the main thoroughfares in Teddington and somewhere Mr Young would have been very familiar with. 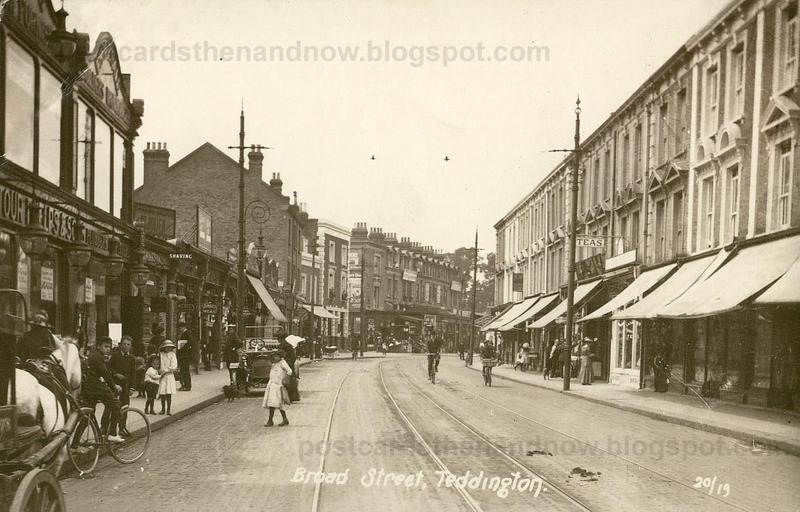 The Causeway looks surprisingly similar today, but the ugly Tesco building in Broad Street is not a patch on the Wintour Phelps shop in the old postcards. Phelps were well known furniture dealers in the area and only closed their last shop in St. Margarets a few years ago. Click the pictures to enlarge. 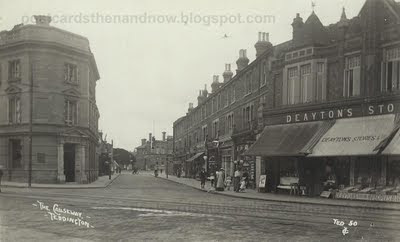 For more old photographs please visit Sepia Saturday. I love all of the detail in the old views. You get to see horses, carriages, bicycles, girls with pretty dresses, curious onlookers. Simply wonderful. The old views are tremendous and give us an isight on how things used to be. Modern architecture has a lot to aswer for. This is way cool! What a great idea to show us the "before" and "after" as you did. Thank you! The thing that struck me in these views were the rows of chimneys. To think that the shopkeepers lived upstairs in their cozy little rooms with fireplaces blazing. What a nice convenient way to live. No commuting at all. Great old postcards. An old shop with a canopy beats a modern shopfront any day. Apologies to anyone who lives in Teddington today, but the "now" streets look so ordinary and featureless. The streets of "then" have so much more character. Same could be said of many places I guess. Thanks for showing us all what it used to look like. Yes, streets with character indeed. I like the way that people are looking at the photographer; the little nursemaid with the pram is so fascinated she's neglecting her charge (who is possibly the only one not looking this way!). The old views have a lot of interesting details and the today views duplicate the old viewpoint very well. Another great time machine post! Mr. Young captures the same moment as Google but without the pixelation. Who bought these kinds of pedestrian postcards? 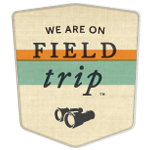 They don't seem like photos for the tourist market. 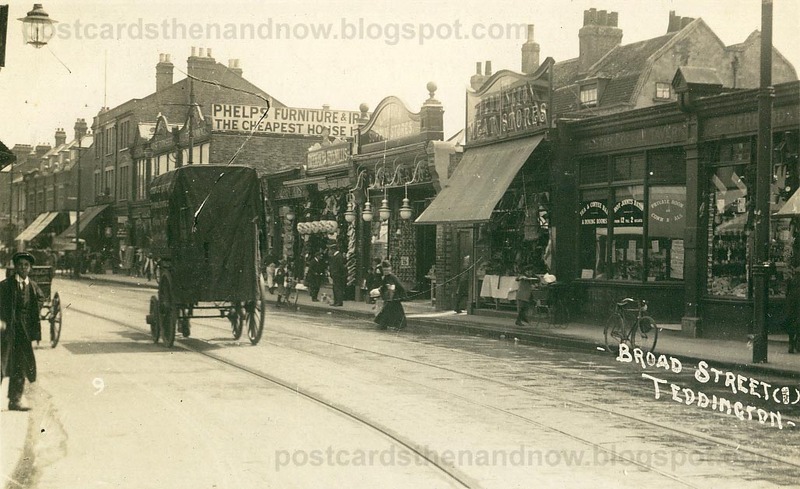 Perhaps the fashion of photopostcards had shopworkers buying them to send to distant relations. Many of the used cards have such mundane notes, maybe they were the equivalent of a text message at a time when the postman made several deliveries a day. Another wonderful collection of comparisons that show just how much has changes - and just how little. Fascinating stuff. How lovely, the old photos of course my favorites! The new Bed City is that what it was before? 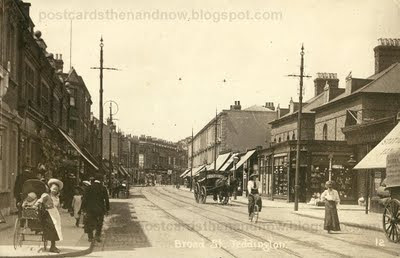 The name Deaytons Store reminds me of our store, Daytons which was created by the Dayton family! He's now our Governor! Great post! I always look forward to my trip over here to see the before and afters. Thank you for your talk at BOTLHS yesterday, really enjoyed it. One of the better ones of this season. I have been working as a volunteer at the local studies library on the Building our Borough project. The plans of many of these buildings will soon be available online, it is interesting where the shops were built with living accommodation behind and above. I believe I will be involved with identifying locations from the collection of photographs from 1970s onward. My family have lived in the borough since the early 1900s so I think I know it fairly well, especially the Middlesex side.